Israeli Border Police detained on Friday, August 30, two senior members of the anti-occupation organization Breaking the Silence near the illegal outpost of Mitzpe Yair in the occupied Palestinian territories. The group’s executive director, Avner Gvaryahu, and communications director, Achiya Schatz, were detained for questioning by border police. Attorney Michael Sfard was also detained for questioning. Police said that the men were detained because the tour group they guided had entered a closed military area. However, this ban on the presence of civilians is not enforced for local settlers. The military order designating the area as a sealed-off zone was signed early Friday morning and went into effect as of 7:00am was meant to prevent Breaking the Silence from conducting the tour it had planned and advertized in advance. The military earlier attempted to prevent the tour from entering Kiryat Arba, a settlement on the outskirts of Hebron, but ultimately decided to allow them to enter. 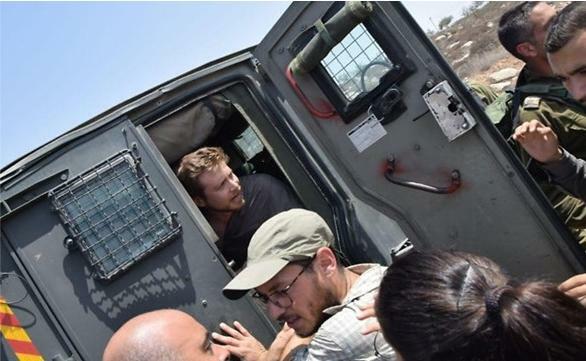 Breaking the Silence issued a statement saying, “The detention of the organization’s CEO Avner Gvaryahu, Ahiya Schatz and attorney Michael Sfard during an educational tour in southern Mount Hebron should worry all of Israel’s citizens who value democracy. The Hebron brigade commander has given an incentive to the settlers who behaved as bullies during an informational and solidarity tour following their violent attack last week against Ta’ayush,” the peace organization added. “This is yet another unfortunate proof that the military has become the servant of the settlers and that they are the true commanders in the field,” the statement concluded. Four Israeli peace activists, members of the Israeli-Palestinian anti-occupation group Ta’ayush, were hospitalized following their attack by settlers on Saturday, August 25. The activists were documenting illegal construction in the unauthorized outpost when at least10 settlers brutally assaulted them and broke their cameras.